Welcome to the New Zealand Association of von Humboldt Fellows. 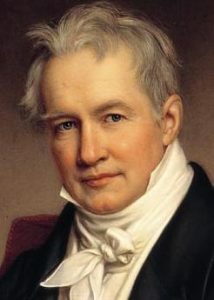 Alexander von Humboldt (1769-1859) was a nature researcher and explorer, universal genius and cosmopolitan, scientist and patron. His lengthy Latin American journey from 1799 to 1804 was celebrated as the second scientific discovery of South America. Members of natural science disciplines such as physical geography, climatology, ecology or oceanography see Humboldt as their founder. The masterpiece of his advanced years, the five-volume “Cosmos. Draft of a Physical Description of the World,” has remained unique in its comprehensive approach. The Alexander von Humboldt Foundation was established in 1953 by the government of the Federal Republic of Germany to promote international co-operation between German institutes of higher education and leading academics from around the world. The foundation sponsors a number of competitive fellowships, ranging from postdoctoral to senior visiting professors, for foreign academics from the areas of humanities, sciences and engineering. Its fellowships fund research visits to Germany usually for a period of 6–24 months. It also offers long-term support to its Humboldt Fellows to develop and strengthen their cooperation with German scientists. It also offers fellowships to post-doctoral fellows and other researchers based in Germany to visit foreign academic institutes as a guest of a Humboldt Fellow. The New Zealand Association of von Humboldt Fellows is open to all current and former Humboldt Fellows. It aims to assist and promote the work of the Alexander von Humboldt Foundation in various ways. We were delighted that Dr Katrin Amian, head of the Australia – New Zealand division of the Humboldt Foundation, visited New Zealand in November. She attended the joint meeting of the Australian and New Zealand Humboldt Associations held in Wellington from 17-19 November. She then spent three days promoting the activities of the Foundation in Wellington and the Universities of Auckland and Massey. Her presentation at Auckland, organised by Leo Cheng, at the Auckland Bioenginering Institute, is available online. 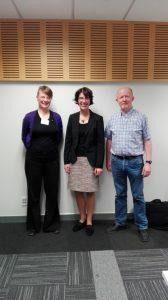 Dr Katrin Amian (centre) with Dr Anna Bauer (DAAD representative in New Zealand) and Professor Eamonn O’Brien (University of Auckland) at Auckland on 21 November.